Child praise and worship music otherwise known as Christian kids music is an excellent way to turn children on to praising and glorifying God. The bible verse below speaks volumes on what God expects from child praise and worship. Psalm 150: Praise the Lord! Praise God in his sanctuary; praise Him in the heavens of his power. Child praise and worship is not only touching but it helps us understand how God must feel when we as adults are worshiping him. Children are spiritual beings and they love to express themselves. 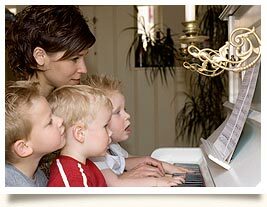 Put those two traits together and children are very receptive to praising God through music and dance. The power of child praise and worship music is one that speaks from our hearts when we worship God. Young children are much more uninhibited than we (adults) are and are more likely to sing at the top of their lungs while dancing. They can't help it though. They are just fulfilling Psalm 150 and bringing God pleasure by praising his power and greatness through praise and worship-their way! Looking for a way to bring more child worship music into your church? The resources below have been developed by talented Christians who are excellent at teaching children Christian kids music while worshiping our Lord and Savior! Check them out: Below are some great resources designed for young Christian students wishing to learn Praise and Worship songs. Children ages one through six love to praise God. (Psalm 8:2) It is so freeing to watch children of this age sing and worship the Lord because they don't care how they look. We need to expose babies and small children to music at an early age. Singing to them when they are infants and singing with them when they are toddlers. Incorporating scripture into these catchy songs is even better. Looking for Praise and Worship for teens? Click the link below.